Born 6 November 1865, Glasgow, Scotland. Professor Sir William Boog Leishman was a Glasgow graduate and a distinguished bacteriologist and pathologist who gave his name to a disease, Leishmaniasis, the cause of which he discovered. 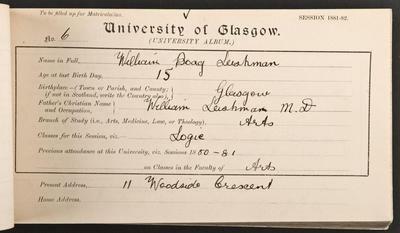 Leishman was born in Glasgow in 1865 and was the son of William Leishman, the Regius Professor of Midwifery at Glasgow from 1868 until 1894. He was educated at Westminster School and matriculated at the University of Glasgow in 1880, at the age of fourteen, to study Greek, Latin and Maths. He began his medical studies in 1882 and graduated with an MB CM in 1886 with High Commendation, but had to wait until November to comply with the Faculty age regulations. After graduation he joined the Army Medical Corps and served in India, returning to work at the Army Medical School at Netley. It was while he was an assistant Professor there in 1900 that he identified the causative parasite of Dum-dum fever (now known as leishmaniasis). 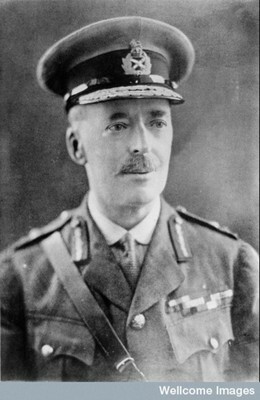 After the war he became the first Director of Pathology at the War Office and later Medical Director of the army medical services. Among many honours, he received an Honorary LLD from the University of Glasgow in 1914. 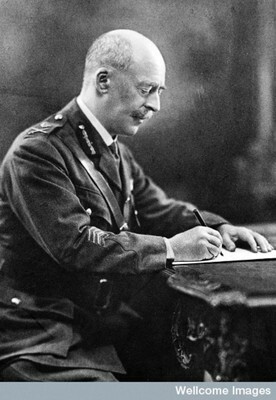 He was created Companion of the Order of the Bath (CB) in 1915, Knight Commander The Most Honourable Order of the Bath (KCB)in 1924, Knight Commander of the Order of St Michael and St George (KCMG) in 1918. He died in London on 2 June 1926.